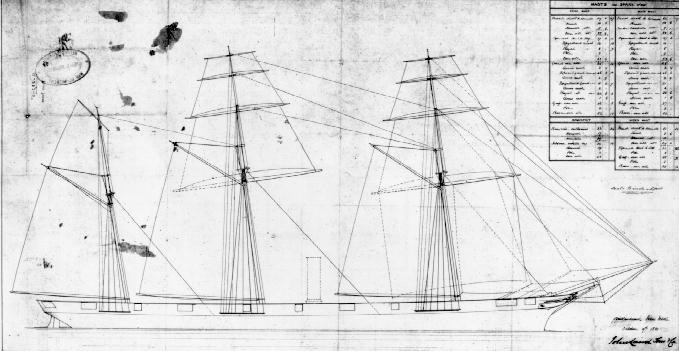 Body plan of the CSS Alabama, 1861, courtesy of the National Archives and Records Administration. 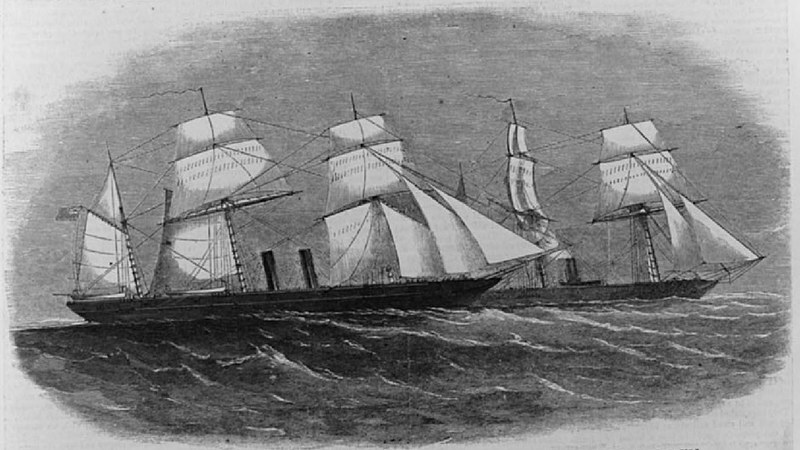 Confederates used the CSS Alabama, a warship built in Birkenhead near Liverpool, to attack Union merchant and naval ships for two years, before the ship sank in 1864. After the war, the U.S. government sued the British government for damages caused by the CSS Alabama and other British-made Confederate ships. The Confederacy had almost no navy when the war started, so southern leaders sought warships to attack and defend against the North. The Confederacy also needed merchant ships to evade the Union blockade and run arms and other essentials into southern ports. In Liverpool, they found both. James Dunwoody Bulloch, the Confederacy's chief foreign agent in Great Britain, led this effort to obtain Confederate ships in Liverpool. He particularly negotiated with John Laird Sons & Co. in Birkenhead, across the Mersey River estuary from Liverpool, to build warships for the South. British neutrality meant that warships could not legally be built in the country for either side, but Bulloch circumvented this problem by ensuring that the ships, while clearly designed for battle, were not actually fitted with armaments in Britain. Through this strategy, the ships could be presented as civilian vessels when they left British jurisdiction, but they would then travel to Terceira, a Portuguese island located in the North Atlantic archipelago of the Azores, where they were armed. Bulloch's subterfuge was blatant, but it successfully confused the legal definition of what could be defined a warship in Great Britain. "The captured Rebel privateer 'Florida' and the United States steamer 'Wachusett," Harper's Weekly, 1864, courtesy of the Library of Congress, Prints and Photographs Division. Like the CSS Alabama, the CSS Florida was a British-made warship built near Liverpool for the Confederacy and financed through connections with Liverpool businessmen. In 1862, Bulloch arranged for the CSS Florida and the CSS Alabama warships to cross the Atlantic and join the Confederate Navy. Other British-built ships soon followed. A combination of Bulloch's diversion and smokescreen tactics, the British Government’s reluctance to be involved, and the complicity of Liverpool's port officials (who were often Confederate sympathizers), allowed the CSS Alabama to successfully sail through. The immediate cost to the Union Navy was heavy. Confederates used the CSS Alabama to attack Union merchant and naval ships for two years, before the ship sank in 1864. Bulloch's own memoir comments on how the building of the CSS Alabama provoked opposition in England and suspicion from the Union; including the suggestion that the ship was paid for by a subscription among British merchants. These attacks gave the U.S. government grounds to sue the British government for damages caused by the CSS Alabama and other British-made Confederate ships, which they pursued and won after the war. The British government was deeply embarrassed by the CSS Alabama attacks and, fearful of being dragged into the conflict, worked actively to prevent a repeat of the incident. Citing the Foreign Enlistment Act of 1819, officials ordered the seizure of the CSS Alexandra in 1863. Charles Prioleau in Liverpool had ordered this vessel to be built on behalf of the Confederacy, and it was registered to the Preston & Fawcett Engineering Co. The ensuing legal action from this seizure served as a test case for future Confederate shipbuilding in Britain. The hearing took place in London, rather than Liverpool, supposedly due to Liverpool's pro-Confederate reputation. Prioleau and Bulloch hired former Solicitor General Hugh Cairns to act as their defense. The courts ultimately affirmed their right to build ships, as long as they were not armed, but the CSS Alexandra case still dragged on through a series of appeals and counter suits. To avoid further litigation, the British Government increasingly relied on executive power to enforce the Declaration of Neutrality. In addition, the activities of James Bulloch were placed under much greater scrutiny. In 1863, the British government also seized the Laird Rams, which were ironclad vessels Bulloch had commissioned to be built by John Laird Sons & Co. The varied reactions to Confederate shipbuilding in Liverpool offer insights into the complicated nature of British popular opinions towards the South. The seizure of the CSS Alexandra was greeted by an editorial in the Liverpool Mercury praising the government's decision to intervene and condemning shipbuilding on the grounds that it was “the interest of a great commercial community like this that the destruction of property at sea in times of war should be as much dismissed as possible.” Yet the same paper would later cover a luncheon for local dignitaries, thrown by Prioleau on his steamer, the Southerner. At this event, Prioleau and Harold Littledale defended shipbuilding and the commercial benefits for the city of working with the Confederacy. Perhaps tellingly, a letter printed in the following day's Mercury attacked Prioleau for his support of slavery, but not his commercial links to the South. Ultimately, public opinion on the Civil War was divided, though commercial opportunities connected to the slaveholding South still received criticism.